After trying popular Veg. 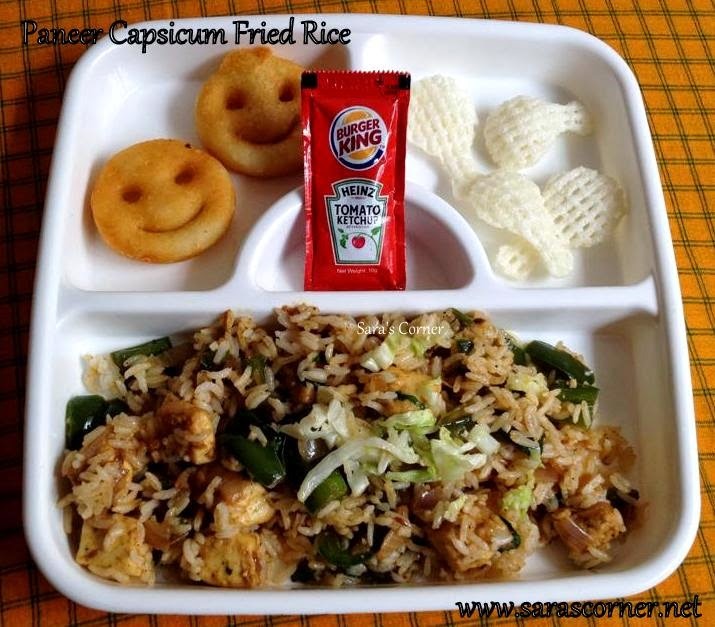 Fried Rice, now I tried Paneer Capsicum Fried Rice for my son. He loves Paneer and Capsicum very much. Usually make once or twice in a week for lunch. It is also easy and fast to prepare in 15 mins. Cooked Rice - 1cup Normal or Basmati Rice. BR tastes good. Wash and shred all veggie into thin pieces. Heat a wide wok/kadai, add oil, add paneer and slightly toss it. Remove it on a plate. Now to the same oil add chopped onion, ginger garlic a pinch of salt and saute. till transparent. Keep the flame high or medium. Add capsicum and saute for 1min. Add cabbage and saute for 1min. Add all sauces, ajinomoto and saute till its half cooked. Add Paneer and saute. Sprinkle pepper powder and mix. Add rice and mix well. Check on salt. Serve with Tomato Ketchup or Gobi Manchurian. I have served with Smiley Potato and Fryums. This is a simple and easy curry. I prepared this I had a leftover sweet potato, H loves sweet potato he always ensures its in our market list. I left it for long time and it started growing too, I showed my son how plants grow. But this potato is not from India its available in local shops just like potatoes but bigger in size with different colour. After we cook it almost looks like carrot. I have tried to give something different. Usually I prepare homemade sweet potato chips. checkout the recipe here it may interest you to try. Wash, remove skin and chop sweet potato into small cubes. Put in water and keep. Wash and cut capsicum into small pieces. Heat a wok/kadai, add oil, add mustard, wait till it splutters. Add hing and curry leaves. Saute it. Add red chilli powder and turmeric. saute it. Add capsicum and fry for 2 mins. Now add sweet potato, sprinkle some water, salt close with lid in medium flame. Cook till its soft with occasional stirs. Once done off the stove. Serve hot with rasam, sambar or curd rice. Notes - You can also add daniya powder for flavour. You can add or reduce chilli powder. I have added more as potato is sweet. You can add more oil and roast it too.